It's a FREE & UNLIMITED way to feed your business. 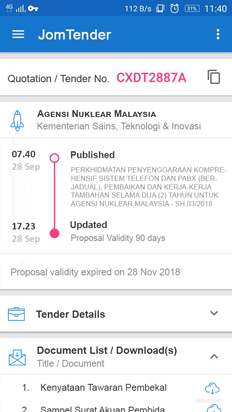 You will receive newly available procurements from Malaysian government agency, GLC, CIDB, local municipal authority and more with out even opening the apps. Push notifications will be send to you daily or hourly base on your setting. Now you don't have to worry missing out any tenders or quotations in the future. Be the early bird! Download FREE now.